Winner of the 2018 BBC Music Magazine Instrumental Award, violinist Fenella Humphreys enjoys a busy career combining chamber music and solo work. Her playing has been described in the press as ‘amazing’ (The Scotsman) and ‘a wonder’ (IRR). Performances have taken her around the world to venues including the Wigmore Hall, the South Bank Centre, and the Helsinki Music Centre. She has broadcast for the BBC, Classic FM, DeutschlandRadio Berlin, West- Deutsche-Rundfunk, ABC Classic FM (Australia) and Korean radio, and performed the Walton Concerto at the composer’s home at the invitation of the Walton Trust in a performance that was recorded by Canadian TV. Fenella’s first concerto recording, of Christopher Wright’s Violin Concerto for Dutton Epoch with the Royal Scottish National Orchestra and Martin Yates was released in 2012 to great critical acclaim (“Fenella Humphreys’s performance is a wonder” International Record Review; “Fenella Humphreys captures the music’s wistful cantabile to perfection, producing a golden tone in all registers with the utmost sensitivity to where every phrase is moving.” The Strad Magazine), and was selected as Orchestral CD of the Month in a 5 star review in the BBC Music Magazine. A number of eminent British composers have written works for Fenella. During 2014/15 she premiered Bach to the Future, a set of 6 new unaccompanied violin works by Cheryl Frances-Hoad, Gordon Crosse, Sally Beamish, Adrian Sutton, Piers Hellawell and Sir Peter Maxwell Davies. The project has so far seen performances at Aldeburgh, St. Magnus Festival, Presteigne Festival, Ryedale Festival, The Forge, Manchester University, Queen’s University, Belfast etc. and is recorded over two CDs for Champs Hill Records. A “radiant recording” with “golden precision and effortless virtuosity” (Five Stars, The Scotsman) the first of these discs, released in August 2015 was picked by BBC Music Magazine as October’s Instrumental disc of the month. The recently released second CD received the same accolade in January 2017’s issue, as well as being picked as Editor’s Choice in February’s Gramophone Magazine. Concertmaster of the Deutsche Kammerakademie, Fenella also enjoys guest leading and directing various ensembles in Europe. 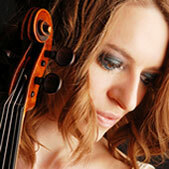 As a chamber musician, she has collaborated with artists including Alexander Baillie, Adrian Brendel, Pekka Kuusisto, Nicholas Daniel, Sir John Tomlinson and Martin Lovett, and is regularly invited by Steven Isserlis to take part in Open Chamber Music at the International Musicians’ Seminar, Prussia Cove. Fenella can also be found playing Tango with the great Uruguayan bandoneonist, Hector Ulises Passarella. Fenella’s teachers have included Sidney Griller CBE, Itzhak Rashkovsky, Ida Bieler and David Takeno at the Purcell School, Guildhall School of Music and Drama, and the Robert-Schumann-Hochschule in Düsseldorf where she was awarded the highest attainable marks both for the ‘Diplom’ exam and the ‘Konzertexamen’ soloists’ diploma. She has taken part in masterclasses with musicians including Thomas Brandis, Lorand Fenyves, Anthony Marwood, Thomas Riebl and Krzysztof Penderecki. Fenella plays a beautiful violin from the circle of Peter Guarneri of Venice, kindly on loan from Jonathan Sparey.